Prairie's Brooke Foster drives to the basket against Kenosha Christian Life's Jaclyn Taft during a WIAA Division 4 regional quarterfinal Feb. 20, 2018 at Prairie. Foster is averaging 16.3 points, 5.1 rebounds, 3.6 assists and 1.9 steals this season. Prairie's Jolie Larson, center, grabs a rebound between teammate Kate McPhee, right, and Kenosha Christian Life's Katie Engle, left, during a WIAA Division 4 regional quarterfinal last season at Prairie. Larson is averging 16.3 points, 5.1 rebounds, 3.6 assists and 1.9 steals this season. WIND POINT — Brooke Foster is the self-described, “lifer” at The Prairie School, with this being her 14th year at 4050 Lighthouse Dr.
Jolie Larson came to Prairie as a freshman in 2015 after nine years at St. Lucy’s Elementary School. The two teammates on the Prairie girls basketball team have forged such a bond since then that they practically know what each other is thinking — on and off the court. They don’t really socialize beyond the confines of the school. Yet, they are so close in another sense that Larson became misty eyed when pondering that each will be going their separate ways after they graduate in May. How do they explain this relationship? The truth is, they can’t. That was evident Thursday afternoon when the two sat in Prairie’s library to be interviewed for this story. As each took a turn answering questions, they occasionally gave each other knowing glances and reassuring smiles. They even picked up on each other’s stories. And it’s certainly been evident during this renaissance season for the Hawks, once a state power which had fallen on hard times in recent years. After successive records of 4-19 and 8-18, Prairie is off to a 9-3 start. Through those first 12 games, Larson and Foster have been the statistical leaders in virtually every category for the Hawks. “I think it goes without saying that when you play together for three and a half years, you get to know each other and you can mentally predict what your teammate is going to do,” Prairie coach Alan Mills said. The 6-foot-Larson, the two-time Metro-Classic Conference Player of the Year in girls volleyball, is the inside presence. The left-hander averages 13.6 points, 8.8 rebounds, 1.4 assists and 1.1 steals. The 5-7 Foster is the outside threat as Prairie’s shooting guard. She averages 16.3 points, 5.1 rebounds, 3.6 assists and 1.9 steals. Mills doesn’t notice it during games, but he concedes there’s an unspoken bond between the two. It’s not obvious. It’s just there. The two first played together as seventh and eighth graders for the Racine Lakers, a local club team. But their bond really strengthened as freshmen, when they were playing for Melody Owsley, an old-school strict coach who retired in 2016. Both were expected to contribute as freshmen and both were learning under fire. Furthermore, both were scared. “We were both pretty nervous to be on varsity together,” Foster said. “Mrs. Owsley was pretty strict about the plays and she gave us packets. We’d be on the bus rides to games and we’d be sitting there going over plays over and over and over. The payoff has come this season. 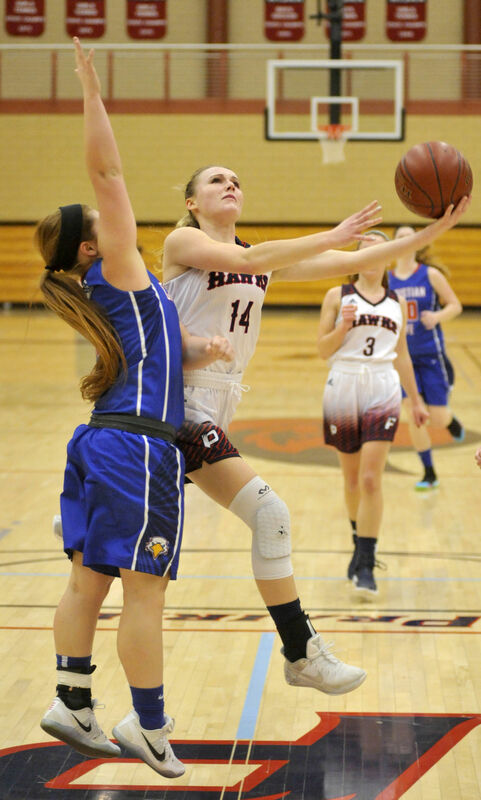 The Hawks have won five straight since a Dec. 15 loss to Shoreland Lutheran, and Larson and Foster have usually been the headliners each game. “I think Brooke being a guard and having the ball is a very smart player and understands the game very well,” said Racine Lutheran coach Steve Shaffer, who was an assistant to Owsley when Larson and Foster were freshmen. “And Jolie knows where she needs to be in the post to receive the ball. There’s been so much more on this team with fellow starters Andrea Palmen at point guard and Abby Decker and Jamie May at wings. Mills said his depth has also been a pleasant surprise with Lizzy May, Kate McPhee, Jordanne Orlowski and Emma Fleming coming off the bench. But graduation is looming and Larson and Foster will soon be going their separate ways after they play high school soccer for the first time this spring. Larson is considering playing volleyball for Rose-Hulman, an NCAA Division III program in Terre Haute, Ind. One of Foster’s options is Carroll College, where her grandfather, father, uncle, aunt and brother received their education. And when the time to move on comes, it will be rough. As Foster spoke, Larson dabbed at her eyes.